Jamestown's American Portraits, a saga of American families and friends, traces the history of America from the founding of Jamestown to the Civil Rights Movement. This is a unique, enriching series designed to teach reading strategies appropriate for historical novels used in middle school reading, language arts, or social studies classes. When the United States enters World War II, Americans everywhere look for some way to help win the war. With the help of her younger brother, 18-year-old Elizabeth Erickson of Chippewa Falls, Wisconsin, finds a unique way to support the war effort and realize her dream of becoming a pilot. While training for the army air force's ferrying program, which put more than 1,000 women to work delivering airplanes for the military, Elizabeth discovers her own courage and resourcefulness-and puts a troubling family mystery to rest. 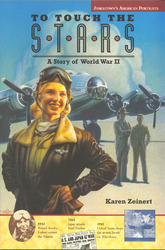 Based on real events, this book highlights one of the least-known and most important home-front forces during the conflict-the Women's Airforce Service Pilots, or WASPs, who delivered 75 percent of the aircraft used during the war.